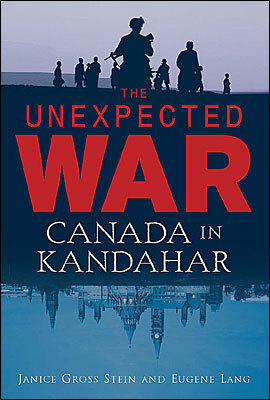 I just finished reading The Unexpected War: Canada in Kandahar by Janice Gross Stein and Eugene Lang (published by Penguin Canada) and I'd highly recommend it to anyone looking to better understand what Canada is up to in Afghanistan. This book isn't really about Afghanistan, it's about Canada's decision making and institutional structures and it points to some real problems. The book shows how government departments (Defence, Foreign Affairs, CIDA) have so far been unable to meet the challenge of working together, which is essential in the new security environment. It shows how the institutional weakness of the Foreign Affairs department has meant that Defence has been driving much of Canada's foreign policy towards Afghanistan. Most interesting of all, though, are the accounts of the relationship between Canada and the United States. Besides recounting the series of decisions that led Canada to Kandahar, the book also talks about Canada's decisions not to participate in Ballistic Missile Defence (BMD) and the war in Iraq. Contrary to conventional wisdom, the book documents how American political leaders such as Donald Rumsfeld respected and understood Canada's decision. In the case of BMD, they were frustrated with Canada's dithering on the issue, not the eventual decision. 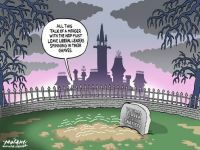 The book is built up interviews, particularly with former Liberal cabinet ministers and even former Prime Minister Paul Martin. As a result, we get a fascinating glimpse into the discussions and inter-departmental rivalries that shape the real world of policy-making. The book is therefore very accessible: it's an interesting narrative, not a dry academic treatment. Another strength of the book is its balance. This is a balanced and fair treatment of the book. The final chapter discusses different options for Canada in Kandahar. There is no neat solution. Anything we do -- from staying to cutting our losses and leaving -- has tremendous costs both to Afghanistan and to Canada's ability to be effective in the new world. What struck me most about this book is how low a priority Afghanistan was for our political leaders and how it has become the major foreign policy question for our country. This is an important debate for Canadians to understand; Stein and Lang have done Canada a service by helping us understand how we got here and what's at stake.